We're excited to have Elizabeth Wein stop by to share more about her latest book, A THOUSAND SISTERS: THE HEROIC AIRWOMEN OF THE SOVIET UNION IN WORLD WAR II. Elizabeth, what was your inspiration for writing A THOUSAND SISTERS? I’ve known about these incredible aviators for at least ten years, and even included a fictional Soviet fighter pilot named Irina Korsakova as a minor character in my 2013 novel, Rose Under Fire. I’ve always wanted to write about these women, but felt that I didn’t know enough about Russian culture and Soviet history to be able to get inside the head of a viewpoint character in a novel. The hardest part of this book to write was the prologue – it got written after all the rest of the book was finished. My editor Kristin and I talked about the need for a strong introduction, something that would draw in young readers and help them to relate to the work’s very unusual and alien material – something to shoehorn readers into the world of these young women battling on the other side of the globe in 1943. That “shoehorn” was the screenplay written by the American novelist William Faulkner for an unfilmed Hollywood epic called BATTLE CRY. A large part of the BATTLE CRY script is devoted to a segment about a pair of Soviet women bomber pilots, based on a radio play from a patriotic series broadcast during wartime. When I uncovered the background for this segment of the film, it seemed the perfect way to make the story accessible. Hollywood in wartime! A Nobel prize-winning American novelist! A-list actors! A possible enemy chemical weapons attack in Los Angeles! It was so fascinating that the true story felt magical – heaven-sent. I spent a solid week drafting the prologue, sent it off with trepidation, and Kristin loved it. It was exactly what the book needed and worked perfectly. I am proud of it and also kind of amazed that it exists – that the story fell into place so perfectly. Gwen Katz has written a thoroughly researched and moving novel for young adults about one of these Soviet regiments – her book is called AMONG THE RED STARS. It’s about a young female night bomber pilot and a daring rescue. For a terrific novel about a young American woman flying in World War II, try FLYGIRL by Sherri L. Smith. The heroine is an African American teen who has to pass as white in order to join the Women Airforce Service Pilots (WASP). If you want to learn more about the Soviet Union in World War II, M.T. Anderson’s young adult non-fiction SYMPHONY FOR THE CITY OF THE DEAD tells a breathtaking story of the tragic siege of the Leningrad, intertwined with a moving biography of the composer Dmitri Shostakovich. How long did you work on A THOUSAND SISTERS? I began research for the book in June 2016, wrote the main body of the text in stages during 2017, and completed the prologue (see above!) in January 2018. I spent most of 2018 revising, fact-checking, and creating end notes and a bibliography for the book. So – about two-and-a-half years altogether. I found it an unexpected pleasure to be working on non-fiction – something that I wasn’t making up. I still had to figure out how to tell the story, much as I do when I’m writing fiction, but the plot wasn’t up to me. It didn’t actually make it easier – more like a puzzle that had to be solved. I enjoyed that and wouldn’t mind doing it again. I was also surprised at how invested I became in learning about Soviet history, a thing I never imagined I would take an interest in. Now I am genuinely fascinated by it. Was there an AHA! moment along your road to publication where something suddenly sank in and you felt you had the key to writing this book? What was it? There are so many ways we can shape our world – I hope that this book inspires readers to fly! Elizabeth's latest novel for teens is a departure in a totally new direction. CODE NAME VERITY is a World War II thriller in which two young girls, one a Resistance spy and the other a transport pilot, become unlikely best friends. A companion novel, ROSE UNDER FIRE, won the 2014 ALA Schneider Family Book Award for Teens. 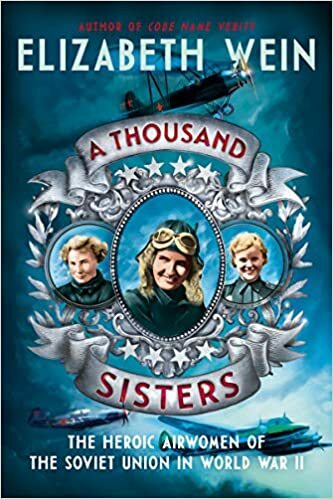 Have you had a chance to read A THOUSAND SISTERS yet? Have you tried writing nonfiction? What type of "call to action" would you put at the end of your current WIP? Share your thoughts about the interview in the comments!